Do you know that there are varieties of small toilet you can get for the toilets in your home? It’s possible that at one time or the other, you have come across toilets in places you have visited, like hotels, where the toilet seats look small in size but are such beauty to behold. The designs are so sleek that you wish you had one in your home. Small toilets have a kind of appeal that makes them irresistible to the eyes. They do everything any other toilet will do. And don't underestimate the strength of a small toilet, it will conveniently hold your weight. A small toilet, also known as a compact toilet, is a type of toilet that, as the name describes, is smaller in size than the normal toilet, but has the advantage of being so easy to fit into your small sized or large sized bathroom. Small Toilets are smaller in structure than the regular toilets but will effectively serve the same purpose. The major advantage of a small toilet, apart from the compactness of its design, is that it's so easy to handle and maintain. A small toilet can easily fit into your bathroom, without taking up large space. They afford you space in the bathroom which you could use for other things. 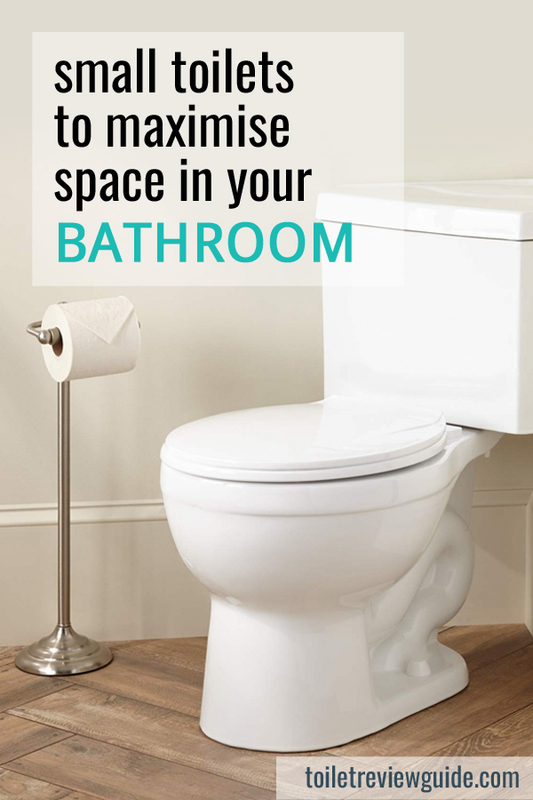 If you are someone who appreciates having enough bathroom space, then consider installing small toilets in your home. Buying a small toilet is one of the good things you can do when remodeling your bathroom. Having given you such background, I believe the following five small toilets are worth their salt and would provide the maximum satisfaction you can ever wish to derive from using small toilets in 2018 and beyond. The Woodbridge T-0001 Dual Flush Elongated Toilet is a classic product from Woodbridgebath and I will say it's very excellent in performance. It's a one-piece toilet with such cute design, its toilet bowl is elongated for seating comfort and it carries all the statistics of a very good small toilet. It is white colored and made of ceramic. It weighs 119 pounds. It is easy and convenient to clean. because of the design of its trapway, no hidden corners, sleek in appearance and skirted in such a way as to allow for easy cleaning. Its low noise flush is superb. Easy installation. This toilet seat, soft closing in performance, is pre-installed and comes with product installation guide including wax ring and floor bolts and a hand wrench tool to fasten the bolts. Dual flush system, consisting of 1-0/1.6 gallons per flush. Good enough to save water, by calculation, it saves 16500 gallons per year, based on the average of 1.28 gallons per flush. Finally, a five-year limited warranty is not bad at all, for Its porcelain parts. This warranty specifically covers fading or staining of the glaze. This is the next small toilet in view, out of all the best in 2018. Saniflo small toilet has a unique design. The technology of the design is what you will really appreciate. It's a self-contained toilet, which also means that it has no external water tank. How then does it flush? Its flush mechanism is inbuilt and it uses approximately 1 gallon per flush. It fits into space within your bathroom conveniently. This toilet seat is electric powered and has an in-built flush mechanism. It saves you water a great deal as it is optimized to flush with 1 gallon of water. Its made of porcelain, white colored and weighs just 62.2 pounds. It can be connected to a sink and it efficiently discharges its wastewater. The pump could make a level of noise during operation, though not offensive. Cleaning it sometimes may require you to make use of toilet brush. Here comes to the American Standard small toilet. That’s actually a very interesting brand name. Anyway, it has some impressive features that I bet you will like. Starting from the height which is just right at 16 ½ inches, then the elongated bowl, which is done with you in mind. After all, who needs a toilet, that won't allow you seat with comfort? You have a choice or option though to choose a round front bowl, compact model or the right-height ones. But, let's see how it goes as we look at its strength and weaknesses. The trapway is excellent in design, no choke point are involved, and a little other easy pass feature, to prevent clogging and to allow for easy movement of waste. The plastic toilet seat of the compact cadet 3 small toilet comes with slow close hinges. That's cute. It stands at 26 inches for height and 119 pounds for weight. You have a limited 5-year warranty on this product. The flushing water strength may be a bit slow and could make you flush twice, to have a really effective clean. Yes. You have a super compact toilet in this package. It's a very good product and not a waste of money in any way. Its elongated toilet bowl design saves much space for your comfort and it has a strong water flush. The components are great and of good quality. The weight is okay at 90 pounds and the height at 28.5 inches. The toilet can be installed easily. No hassles with that. It's compact and small, yet sturdy and strong enough to hold your weight. It comes with all that is needed to install it, bolts and tools. Soft close seat and comfortable too. Flush strength is excellent. That notwithstanding, it's flush strength and water levels is adjustable. It fits easily into a tight bathroom and utilizes a dual flush mechanism. Delivery company you've contracted to ship it might need to give extra care to ensure safe delivery. Apart from that, no issues with this small toilet seat yet. This small toilet is quite beautiful. I think its lovely. It's well designed, coming with glazed surface and elongated bowl for sitting comfort. Yeah! It's easy to install with all you need to install it also coming with it. Flushing power is very good and low noise. It has a slow close seat cover with a nice shape. It's good to take out some time to check out this product. It uses siphon flushing technology, which of course is a standard among the best toilets. For a better understanding, siphon flushing technology is that which allows atmospheric pressure to push water or a liquid upward, over a barrier into a lower container, possibly an outlet. That's what you will experience when you flush this small toilet. Slow close toilet seat. The toilet seat is elongated for comfortable seating. Easy to install. It comes with installation guide, a wax ring, bolts, and cover. The cleaning is easy and it has a self-clean glaze that makes it easier, so you won't have to go looking for a cleanser. White colored. The height is good at 28.5 inches and it weighs 125 pounds. Pretty at that. For all its worth, it's a good quality toilet, but you may find its really small, if not smaller than you thought or expected. But I will guarantee your kids will love it more. The material from which this product is made is very important. Small toilets are made out of two types of materials which are ceramic or porcelain. Those are the two you must look out for. These materials are responsible for the weight and the sturdiness of the product. Besides this, the porcelain or ceramic is that white part of the small toilet that is precast. It is also shined for a sleek look and feel of the Toilet Seat. Is the small toilet easy to wash? How easy is it to clean it? This feature is one of the few you have to look out for. Is the design such that it allows you reach the inner hollow with your cleaning brush to wash or to remove clogs of waste that might stick on the flush way? Most small toilets consume so little water compared with regular toilets. Small toilets that are highly efficient in water usage consume less than 1.6 gallons per flush. This is far less, in comparison to 2.5 gallons used by the regular home toilets. Overall, using a small toilet will bring down the water bills. One other important feature of a small toilet that you must look out for, before committing your money to buy, is the installation procedure. How easy is it to install? It is very good to see and ensure that your small toilet is easy to install. Luckily enough, lots of them come with installation manuals. As an addition, a few of them also come along with one or two installation tools, such as a wrench, so you don't have to worry yourself about where you are going to find installation tools. Like regular toilets, small toilets come in various design. There are two-piece toilets which have a tank fixed on top of the toilet bowl. These are very common and are cheaper. One-piece toilets have an inbuilt water tank and the toilet seat and tank are integrated. This is a unique design and it’s costlier than the two-piece toilet. The major difference here lies in the choice or taste of the buyer of the small toilet. It could come in any of the two forms. While the round bowls may save space, they do not provide the seating comfort of the elongated toilet bowl. Another thing is that round toilet bowls are cheaper anyways than the elongated. So, it's a thing of the mind, taste, and choice. You could sacrifice money for comfort or sacrifice comfort because of the money. You have options here, but the norm or standard now is the soft closing toilets. If you'd like something more, you could order a heated toilet seat. Now the main purpose of the soft closing toilet seat is to ensure the toilet is closed after use. These are just a few features that I have seen and it makes me love these products. Some small toilets possess a low noise feature, that when you flush, you won't hear such loud, gushing noise as in the case with regular toilets. The flush system is well designed as to give a smooth, low noise and effective flush of the waste matter. This factor has to do with electrically-powered flush systems. The electric supply could be the normal household voltage (110V) or a supply from a couple of batteries.